Jordan Wynn's retirement from college football lasted about two months. Even though the former Utah starter isn't going to return to the field as anyone's starting quarterback, he is going to start molding new starters in Hawaii. Hawaii coach Norm Chow hired Wynn to be his quarterbacks coach starting in January. It's a rare opportunity afforded to a player who already has a degree in economics, but would be classified as a collegiate junior. 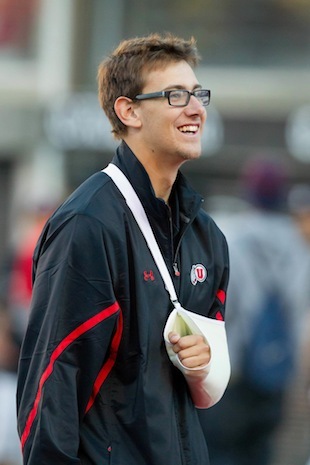 Wynn's collegiate career was cut short against Utah State on Sept. 7 when he suffered his second season-ending shoulder injury. He suffered the same injury the year before. He announced his retirement the following Monday. Chow, who used to be Utah's offensive coordinator before accepting the head coaching position with the Warriors last year, spent a lot of time with Wynn while Wynn was recovering from a shoulder injury during his sophomore year. "The time we were together, I enjoyed it immensely," Chow told the Salt Lake Tribune. "He is going to take our quarterbacks and be our quarterbacks coach, and I'm really excited." And Wynn will have a lot of work to do immediately. In the past, Hawaii quarterbacks had been known for their run-and-gun style, but that hasn't been the case this season. Junior Sean Schroeder is completing 51.7 percent of his passes for 1,546 yards and nine touchdowns with 10 interceptions. Consequently, the Warriors are 1-8 and on the verge of their worst record since going 0-12 in 1998. "It's a lot to handle," Chow said.